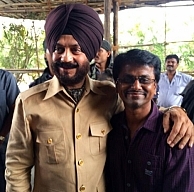 With Holiday set for release on Friday, the 6th of June, director A.R.Murugadoss recently screened the movie to the chairman of the All-India Anti-Terrorist Front, Maninderjeet Singh Bitta, who was really moved by the movie and felt emotional. Those who have seen the Tamil original, Thuppakki would know that the movie was an ode to the Indian Army and the climax scenes moved quite a few among the audience as they realized the sacrifices that Army men had to make, to protect the country. Holiday features Akshay Kumar in the lead role and it would be the star's widest ever release, with 3500 plus screens in India and around 400 screens across 41 overseas markets. Sonakshi Sinha replaces Kajal Aggarwal from the original while Pritam takes credit for the music. 8 days to go and Amala Paul in a hurry! 'Rettai' Thala for 'Thala 55' ? THE date for Suriya fans! The release date of Vijay's ambitious project! People looking for online information on A R Murugadoss, Akshay Kumar, Holiday, Thuppakki, Thuppakki remake, Vijay will find this news story useful.